The ancient Greeks and Romans were aware of the existence of the pancreas (the word pancreas is derived from the Greek for 'sweetbread') but its function only began to be understood from the late 1800s. 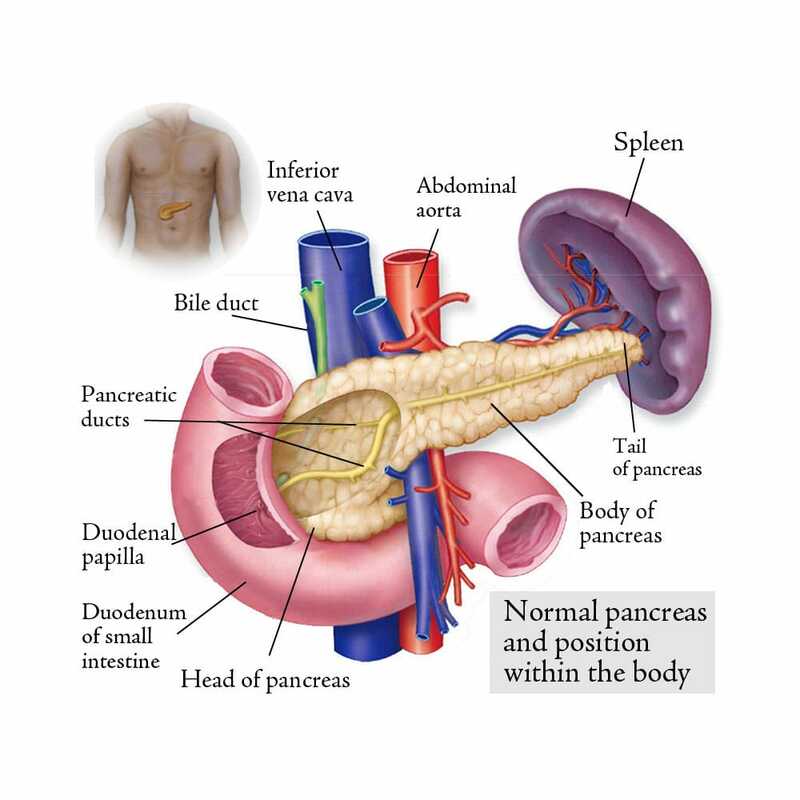 Pancreas is located behind the stomach in the abdominal cavity and is generally around 22cm long. It consists of head/uncinated process, neck, body and tail. It lies deep in the retroperitoneal space intimately relates to a number of structures including – the first and second parts of duodenum lies to the right of the head of pancreas and the bile duct running between them. The main pancreatic duct drains together with the distal bile duct into the second part of duodenum through ampulla of Vater. The neck of pancreas lies in front of a major vessels in abdomen, portal vein and superior mesenteric vein. The head of pancreas is like a major intersection in the centre of abdomen with a number of vital structures running close by. Thus, any tumour affecting duodenum, distal bile duct, ampulla or pancreatic head requires radical surgical treatment removing all of these structures as a unit, called Whipple’s procedure or pancreaticoduodenectomy. The body and tail of pancreas lies close to spleen. The splenic artery runs along the upper border of the pancreatic body and splenic vein runs deep to it. The tumour in the body and tail of pancreas may need, thus removal of spleen as an en bloc. Pancreas is a gland with two primary functions - firstly the production of enzymes that allow food - carbohydrates, proteins and lipids (fats) - to be digested (exocrine function), and secondly the production of a number of hormones, including insulin and glucagon, which regulate the amount of sugar (glucose) in the blood (endocrine function). Almost all of pancreas (95%) consists of exocrine tissue has exocrine tissue.